The power pack 445 is a dial adjustable dumbbell that comes with a nice rack to store them. This is a bit older model but still gets the job done. 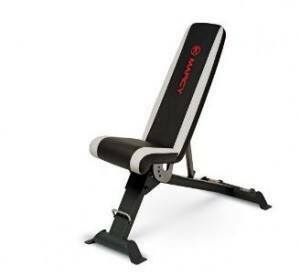 Impex Fitness has produced a great option here with the Marcy Adjustable Utility Bench for a basic home gym. You can pick it up for a low price, but it’s also a bench that comes with plenty of options to target all the muscle groups you want and has easy moving and storage options. Nothing too fancy here – but a straight up solid bench that would be perfect for the home gym. There are 6 different angles for the backrest – including a decline position so you’ll everything you need for chest presses, incline presses, military and decline presses. And of course the flat position for your fly. The seat itself adjusts to three positions to support you in every angle. This is a big plus as most benches leave a big gap! When assembled the bench measures 52” by 25” by 46.5” in height for the upright position. It weighs 46lbs– not overly lightweight but not too heavy that you struggle to lug around. The bonus with this bench is it folds fully flat for storage so you can tuck it into a closet or under your bed – perfect if you live in an apartment or small space and can’t have your bench taking up all the room at all times. The frame is a solid construction, built with 14 gauge steel to keep it sturdy when in use. The steel is powder coated to finish to help protect against rust and scratches. The backrest and seat cushions are boxed upholstery made of a top-grade high density foam for support and comfort during training and to reduce muscle fatigue. It’s black with white strips down the length of the padding which makes for a nice change from pure black and grey benches that seem to dominate the market. There are also transport wheels and a handle grip for easy moving in and out of position. It’s up to you to assemble this bench but it comes with instructions and wrenches. The hardware to put it together may not be the best quality however so it may be easier to find your own wrenches for the job. It actually recommends two people to assemble so grab a mate or your partner to give you a hand. There’s no leg support with this bench for the decline position which can make working in that position a little more difficult – you’ll just need to be super controlled and engage your core so your feet don’t flail about. Also the seat and back cushions are not perfectly aligned in the flat position so just be aware of that – but it shouldn’t be detrimental to your workout. There is a bit of spray paint on some of the nuts and bolts which can make it a bit more difficult to assemble – so the best option is to try and strip off the paint first rather than wear out the tools and materials. Unfortunately there have been a few reports of users needing to get new parts like nuts and bolts replaced due to some missing from the package, which isn’t a great thing to have on the record. Having said that there is a two year warranty with this bench so the manufacturer should be able to sort replacements out fairly promptly should you need it. Just make sure you’ve got everything you need and the parts are in good condition because if you don’t assemble it properly you might find it somewhat unstable. While the frame is sturdy, there is only a weight capacity of 300lbs which is on the lower side of options. So it depends on how much you’re lifting as to whether this strength training weight bench will be appropriate for you. I really like how this bench is made. 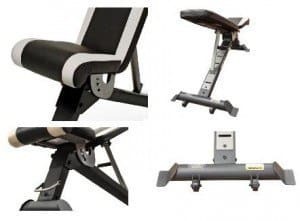 You have the extra thick foam, plenty of angles to adjust for any exercise, you can move the seat to close the gap between the top seat and the bench, has wheels to move it around and the legs are actually flat! This is a great sturdy bench for the price by far. You find more about it on amazon here to see the discounted price for it. Still not sure check out our best weight bench review page here but I’m sure you will be back to this one as it’s a great buy for the price. ← Is The Universal 5 position Weight Bench For You?